Photo by Matt Murnan / The award for Best Undergraduate Presentation in the 2016 Student Research Symposium was a tie between two groups, including this one comprising Carolyn Wong, Jason Upton (center) and Adam Wilson (not pictured: Baylee Wiechecki). 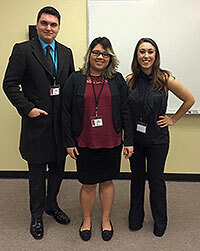 REDDING, Calif. - Nine Simpson University students were honored for work presented during the university’s 6th annual Student Research Symposium. The Stanley Clark Student Research Awards were presented at the conclusion of the March 5 daylong symposium, which featured 25 presentations and posters by undergraduate and graduate students. Photo by Kendra Kaiserman, The Slate / The award for Best Undergraduate Presentation in the 2016 Student Research Symposium was a tie between two groups, including this one comprising Tyson Setterlund, Sadie Setterlund (center) and Carley Jones. The award for Best Undergraduate Presentation was a tie between two groups. “Toxicity of Fire-Retardant Chemical on Plant and Fish Life” was presented by Tyson Setterlund, Sadie Setterlund, and Carley Jones; and “Evangelical Womanhood: A Qualitative Study” was presented by Jason Upton, Baylee Wiechecki, Adam Wilson, and Carolyn Wong. Award recipients, who also will be honored during a student awards chapel next month on campus, will receive a plaque and scholarship funds. The awards are named after former Simpson University Provost Stanley Clark, an enthusiastic supporter of the research symposium. Following his 2012 retirement, Dr. Clark and his wife, Susan, established The Clark Endowment for Student Research to support student scholarly activity. All students who participated in the symposium as presenters were eligible for the awards. A faculty panel served as judges. The symposium began in 2011 as a faculty initiative to give students an opportunity to share their research outside the classroom. Divided into morning and afternoon sessions, the symposium is modeled after professional academic conferences. Learn more about the symposium at simpsonu.edu/researchsymposium.